In our mind-intense, fast paced society, we are only as good as our brain function. So, we need to pay attention to feeding the brain with essential nutrients. Cancers and infections, such as urinary or candida, need an acidic environment. Alfalfa is the most potent alkalizing agent. This vegetable’s name came from the Arabic for, ‘The Father of all Foods’. Due to its enormously long (many meters) roots, we all worry about the mineral depletion of our soil, which contains 50% less calcium, magnesium, etc than 50 years ago. Modern farming methods have so depleted the soil that even with the perfect diet we can’t get enough minerals…..
Remains of Alfalfa leaf have been found in Persian ruins dating back six thousand years and early Turkish writings mention Alfalfa around 1300 B.C. in terms of healing and nutrition. Traditional Chinese Medicine has used alfalfa leaf to stimulate the appetite and relieve ulcers. Indian Ayurvedic medicine has used alfalfa leaf to relieve water retention, arthritis, and ulcers. Colonial Americans used the plant to fight scurvy, menstrual difficulties, arthritis, and urinary problems. Native Americans used the seeds as a thickening paste and nutrient additive. Herbal physicians in 19th century America used alfalfa as an ingredient in general tonics. 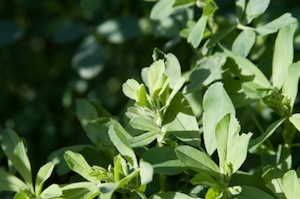 At home, alfalfa seeds were ground into a poultice used to soothe insect bites. Nursing mothers have also used the leaf, which is believed to help stimulate the flow of breast milk. Gaweł E. Chemical composition of lucerne leaf extract (EFL) and its applications as a phytobiotic in human nutrition. Acta Sci Pol Technol Aliment. 2012 Jul-Sep;11(3):303-10. Review. Medline Plus. Alfalfa. 2012 December 20. Bora KS, Sharma A. Phytochemical and pharmacological potential of Medicago sativa: a review. Pharm Biol. 2011 Feb;49(2):211-20. doi: 10.3109/13880209.2010.504732. Epub 2010 Oct 25. Review. It’s an inexpensive green powder, that can easily be added to a juice or taken with a little water daily. Please feel free to buy from our receptionist and try it out for yourself!